Nothing ages quite like technology. And these old adverts might just be the reminder you need the next time you’re cursing your iPhone or beating your computer for not being flashy or fast enough. 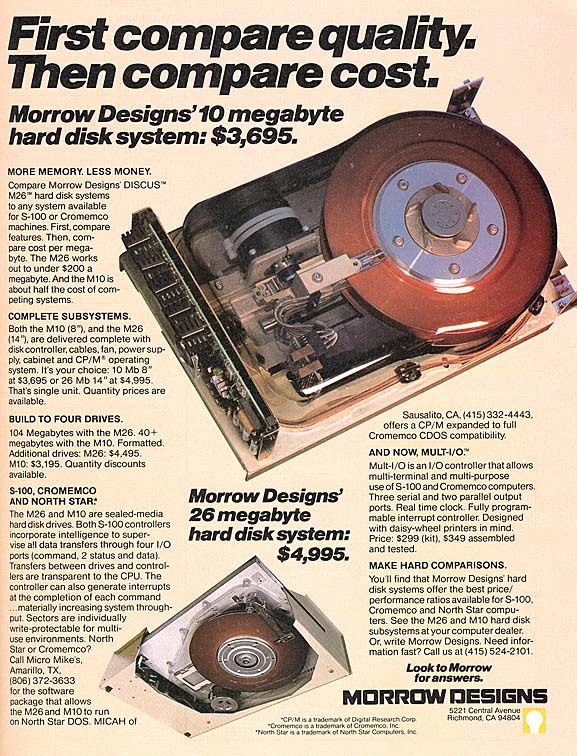 Morrow Designs point out that they’re better than their Cromemco rivals because their system works out at under $200 per megabyte. Not quite the same kind of deal we’re used to today. 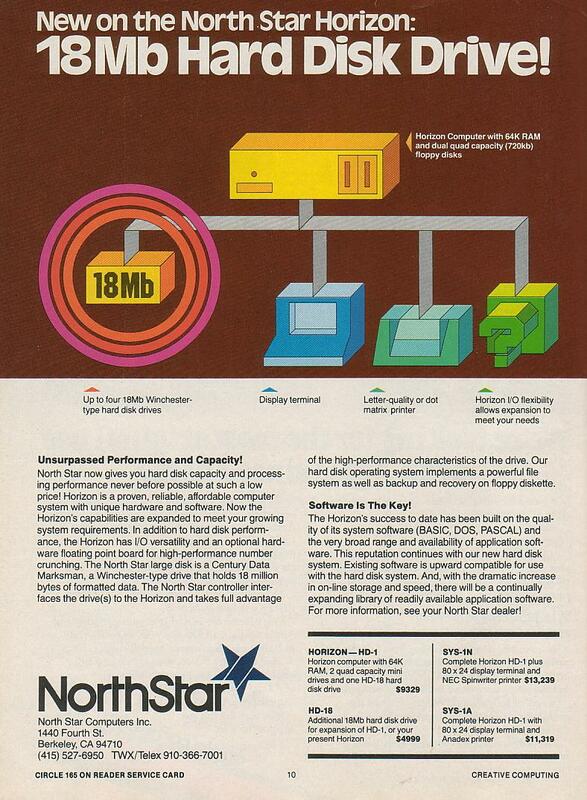 This full-page ad by North Star Computers appeared in the Februaury 1980 issue of Creative Computing magazine and is one of the earliest ads offering a Winchester hard disk drive for a personal computer. 10MB of XComp hard disk for $3398. I tried phoning the number but apparently the offer has expired. 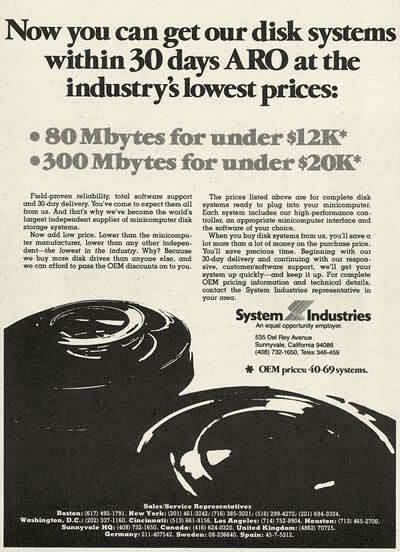 This System Industries advert is from 1977, when it was apparently a great idea to boast of things like “80 MB for under $12,000”. Once you’ve closed your mouth and finished gawping at the unbelievable figures, here’s some food for thought. 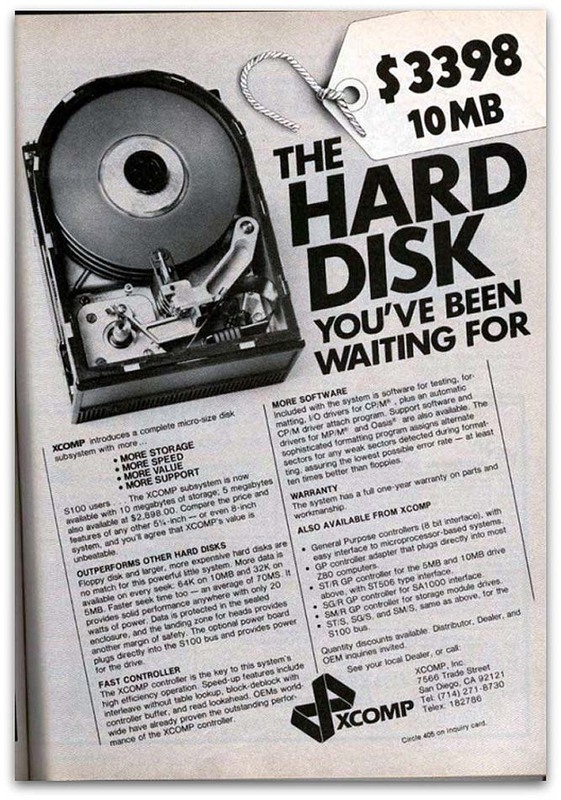 Prediction: The cost for 128 kilobytes of memory will fall below U$100 in the near future. At $100 for 128 kilobytes, the price of 64 Gigabytes- the capacity of the largest iPhone or iPad- would cost over 51 million dollars. Compare all of that with the announcement IBM made earlier in the year that after five years of work, its researchers have been able to reduce from about one million to 12 the number of atoms required to create a bit of data.